with Repton 2 selling 35,000 itself. The games have since been remade for numerous more modern systems, most recently as iRepton for the Apple iPhone / iPod Touch in 2010. 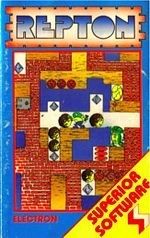 The eponymous protagonist, Repton, is an anthropomorphic lizard who walks around an underground maze in a quest to find all the diamonds (some being held in safes, their release being triggered by finding and collecting a key) within a time limit in each of several levels, while avoiding being trapped or killed by falling rocks and monsters hatched from eggs. The original Repton game was released in the summer of 1985 and has 12 levels, with passwords making it possible to jump directly to later levels. If passwords were used though, on completion of the final level, the displayed message challenged the player to complete the game without using them. The new versions of Repton for the PC and iPhone introduce new levels; and "Repton Spectacular" contains new Repton levels.